Port of Call is a stunning and modern apartment in a timeless location: almost directly on our beautiful National Trust Coast path leading around Morte Point, past the lighthouse and beyond to Lee and Ilfracombe. It is a very spacious two bedroom ground floor, easy access, easy parking apartment in a well maintained development of similar high spec contemporary properties constructed on the site of the popular former Rockham Hotel in Mortehoe village. A perfect location for exploring our coastline and perfect for a dog friendly holiday! The lounge kitchen diner spans front to back with the front being nearly all glass with patio doors looking out over the small front terrace towards the Mortehoe coastline. There is a glimpse of the sea to the far left. You can walk to the nearest local beach at Rockham Bay which is great for rock pools and bathing. The surf beaches in the sister village of Woolacombe are just a short hop by car or a pleasant walk of about a mile. Port of Call is in “walkers and dog lovers paradise” with the coast path stretching in both directions and the beauty of Morte Point is on your doorstep! The village has some of the best local pubs serving good locally produced food and real ales, tea rooms, church, Mortehoe Museum, Post office, general store, gift shop and a deli serving indoor cream teas and selling clotted cream ice creams in about 12 different flavours! 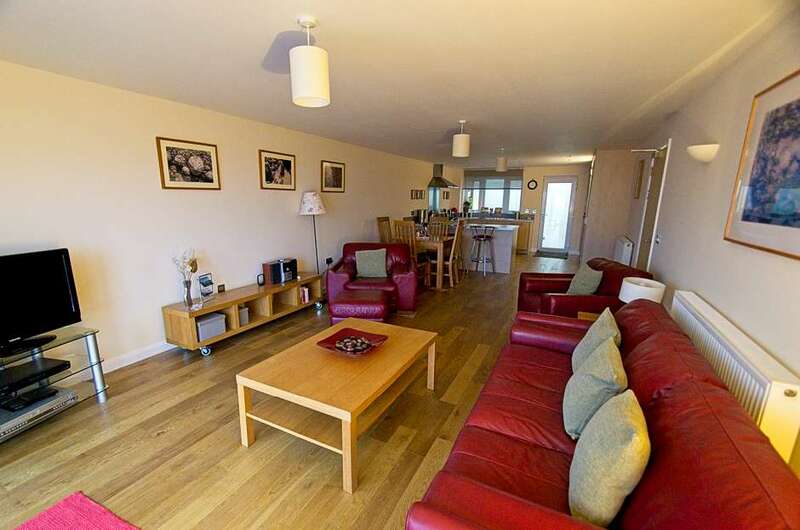 The apartmenthas has beautiful wooden flooring laid throughout the hallway and main living areas while retaining cosy carpeting in the bedrooms. A superb kitchen is at the far end of the living space and houses integrated full size dishwasher, washer/dryer, 50/50 fridge freezer, electric double oven and gas hob and microwave: there you can also go out to the delightful courtyard for a morning coffee and a read of the paper. The lounge area has sumptuous red leather sofas, coffee tables and sideboard with CD/Stereo. There is a Freeview TV, DVD, PS3 and games and free WiFi available. The master bedroom has a king size bed, “wet room” style en-suite, Freeview TV and has patio doors to the small front terrace. The spacious second bedroom at the rear has twin beds and a door out to the lovely enclosed rear courtyard garden. There is an impressive family bathroom with really contemporary fittings, good lighting and large mirrors inlaid in the tiling. This is one of our highest spec apartments with a fabulous and well laid out interior complete with a pretty courtyard style garden ideal for your dog to snooze in the sun. £20 charge per dog.